So, I've been learning python for the last year and have piles of tools I could use...when my brain remembered which module they were in and what the call arguments were. Handy, I know. As efficient as that was with all of our diabolical plans it made sense to have tools that were usable for other people. Initially I looked at doing QT but after talking to some friends I had concerns about compatibility with artists all over the place. Eventually these tools will be a part of the Morpheus suite so I wanted to get as few potential blocks out of the road as possible. So the last few days I've been digging in to basic maya gui making and all the craziness that entails. Adding error checks (that seemingly Maya 2010 and below don't support mc.warning nor the wordWrap tag...yay....) and getting a feel for things. Now I've got a pretty well functioning tool in 2011 and above. Build a base tool module that all the rest of our tools can be built from. Less steps. Anything created with a tool should be named intelligently. I'm using my bbAutoName stuff as a base for naming everything in the system and it's working pretty well so far. 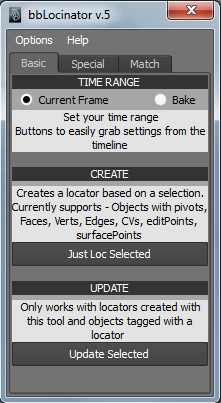 Makes named locators off of pretty much anything - anything with a pivot, faces, verts, edges, cvs, curve or surface points and I think that's it. Locators created match point, rotation and rotation order of source objects wherever possible. Get the template stuff nailed down so that any tool can call what it needs. If you have thoughts, suggestions, insults or whatever, post em!